Being foodie types, our family gets tired of the same old meals week after week, so I am always searching for fresh fare. 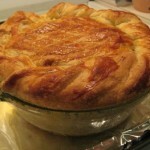 A few weeks ago, I discovered a tasty recipe for beef and beer pie. I’m honestly not quite sure what inspired me to try it… I don’t even like beer. Though, I must confess, it’s great for tenderizing beef. I modified the recipe a bit, but you can find the original here. Preheat oven to 375 degrees F. In a large dutch oven on the stove, heat olive oil on low heat. Add the onions and cook until translucent and lightly caramelized. Turn the heat to medium-high and add butter and the rest of the vegetables (except peas). Cook for two minutes until fragrant. Make a well in the middle of the veggies, then add the beef, herbs, salt and pepper. Sear beef for 3-4 minutes, then pour in the Guinness, flour and just enough water to cover. Bring to a simmer for five minutes. Cover the pan with a lid and place in the preheated oven for 1.5 hours. Give the stew a stir and let cook for another hour, until tender and thick. If stew is still liquidy after an hour, allow it to cook a little longer (check every 15 minutes). Remove from heat, stir in half the cheese, taste and season as needed. Let cool slightly. Cut 1/3 of the pastry from the sheet, leaving a larger piece with the remaining 2/3. With a floured surface, roll both pieces out evenly using a floured rolling pin to the thickness of a silver dollar. Butter a pie dish, then line with the larger sheet, leaving the edges hanging over the side. Pour the stew into your lined dish, add the peas, then sprinkle over the remaining cheese. Brush the edges of the pastry with a little beaten egg to help pastry seal better. Cut the other rolled piece of pastry to fit the top of the pie dish and crisscross lightly with a sharp knife, being careful not to cut all the way through. Place it over the top of the pie and fold the overhanging pastry onto the pastry top, rolling to make the edges. Brush the top with beaten egg, then bake the pie on the lowest oven rack for 45 minutes, until pastry is cooked and golden. Place a cookie sheet under the pie tin to catch any leaks. Remove from oven and allow it to sit ten minutes before serving. Everyone in our family gives this recipe and enthusiastic two thumbs up! Ben says, “Let’s eat it again on St. Patrick’s Day.” That’s the plan, buddy. Karen (that’s me) says, “This is an easy two-dish dinner packed full of veggies. Easy to cook, easy to clean up. It’s a great meal to cook on a rainy afternoon because it fills the house with yummy smells.” I’ll definitely make it again…. St. Patrick’s Day! Come back tomorrow for a special Irish treat! I’ll be sharing photos from the Emerald Isle taken by wonderful photographer and friend, Steffanie Lafors…. after all, if you can’t be in Ireland for St. Patrick’s Day, at least enjoy the scenery. Right? Sign up for posts by email and get each one delivered into your inbox. You can also join the conversation on Facebook and Twitter. I love this! Being Irish myself, I’ve loved every chance I ever had to try my granny’s food and this is looks so similar to something she used to make. Since she passed on without leaving her recipes, I’m happy to try this one out! That sounds wonderful. This may be a dish I’ll try for St. Patty’s day this weekend! I’ve been meaning to make pot pies for dinner. I think I’ll try this instead. Sounds yummy. We have a goal in our house that each week we try at least 3 new recipes in an effort to get out of our old rut and to try some new flavours. This may have to be added to next weeks menu! My husband would LOVE this recipe. Thanks for sharing! Seriously! I’ve been avoiding beef this entire pregnancy, but this makes me want to delve right back in! Love anything put in a pie crust! Yummy!